This is a book about evil in the context of education and how societies might live together on this planet in less harmful ways. 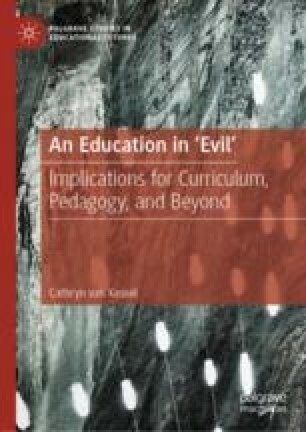 Evil might seem like a strange choice to explore options for better relations with each other, but this area of inquiry can help those interested in education think through ethical issues in curriculum, pedagogy, and perhaps even in their daily lives. The theme of this book is that although it may be uncomfortable to discuss evil, it is nonetheless important. Everyone has a sense of what evil is, but many of us ponder neither its nature nor how it functions, let alone how someone’s understanding can vary—and current educational research reflects this paucity of direct engagements with evil. Hardy, T. (n.d.). In tenebris II. Retrieved from http://www.theotherpages.org/poems/hardy01.html. Harper, D. (Ed.). (2014). Evil (adj). Online Etymology Dictionary. Retrieved from https://www.etymonline.com/word/evil.